2 Corinthians 4:7(AMP),“However, we possess this precious treasure [THE DIVINE LIGHT OF THE GOSPEL] in [frail, human] vessels of earth, that the grandeur and exceeding greatness of the power may be shown to be from God and not from ourselves. We have treasure in earthen vessels. The Bible has defined this treasure in our theme scripture; it is the DIVINE LIGHT OF THE GOSPEL. Where one’s treasure is, so is their heart also (Matthew 6:21). Men go treasure hunting, experience all sorts of difficulties and face up against all sorts of odds while at it because their hearts are panting after treasure. Hearts follow treasure, treasure does not follow the heart. 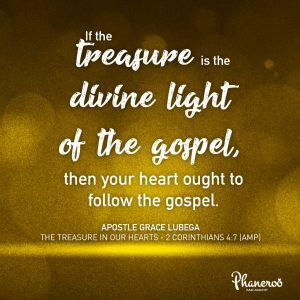 If the treasure is the divine light of the gospel, then your heart ought to follow the gospel. Our heart is in the gospel because it is the power of God unto Salvation for all that believe (Romans 1:16). Our heart is in the gospel because the preaching of the cross is the power of God unto us who are saved (1 Corinthians 1:18). When your heart is in the gospel, the inevitable result is that through you, God demonstrates the exceeding greatness of His power. PRAYER: My heavenly master, I give you praise for this day. Thank you for this great Word. Today, I choose to live life with my heart fully invested in the gospel. Like a man following after treasure, I follow after it. Your power is demonstrated through me everywhere and every time. In Jesus Name. Amen.